These cookies are a gluten-free DREAM! There are only 6 ingredients, all of which are just naturally gluten-free, and they taste AMAZING. 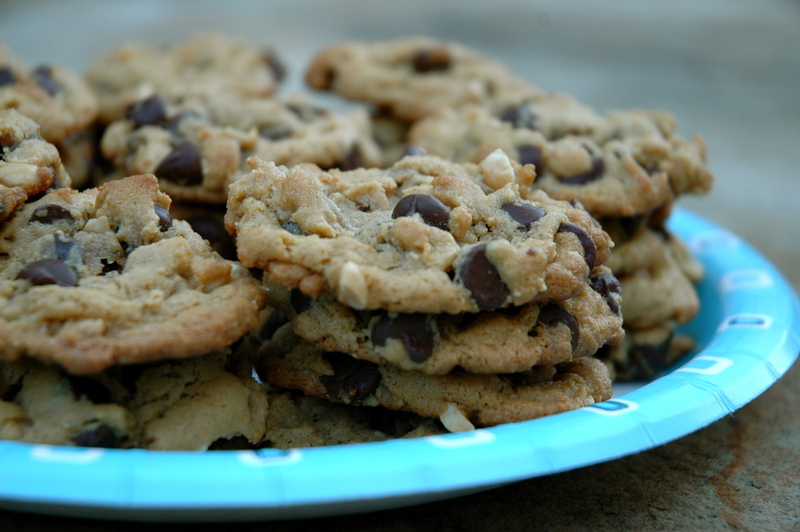 They are the kinds of cookies that you could serve to guests and have to give out the recipe. Enjoy! Blend all ingredients together. Drop by teaspoons on cookie sheet. Bake for 8 minutes at 350. Do not overbake. Makes about 30-36. I clearly remember my first gluten-free Thanksgiving. 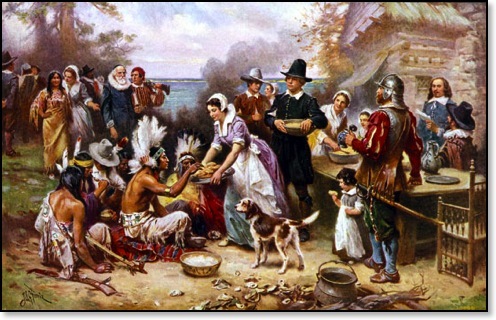 Preparing the traditional meal is daunting enough, but trying to do it gluten-free while maintaining all the favorites for everyone seemed to me like just a taste of what those early Pilgrims must have gone through! They too were in a whole new world with foreign foods, learning to cook, prepare, and adjust to their new way of life. I’m sure they had a few meltdowns like I did with moments of panic that they would never eat normally again. But, I’m also sure that they made it through, learning and growing with each step, and persevering to create health for their families and a heart of thanksgiving for all that their Creator had provided. This gluten-free life means lots of adjusting, and I’ve found that the attitude adjustment is the first and hardest step. Once I’ve let go of expectations and just been willing to enjoy the foods I can eat, my taste buds get in line rather quickly. If my heart is thankful, my taste buds seems to follow suite. Thanksgiving may seem like a long list of “can’t – haves”, but actually it is so easy to make gluten-free. Now that I have my system down, no one could tell that there are any differences at all. Stuffing – don’t panic! Just make a loaf of gluten-free bread (I’d recommend getting an easy mix like “The Gluten-Free Pantry’s Favorite Sandwich Bread”) gluten-free cornbread (my favorite recipe is in here, but I’d cut the sugar just a little for using it in stuffing) and use them to make this recipe. Stuffing seems intimidating, but it’s super easy! Gluten-free Green Bean Casserole – if you’re used to the version with cream of mushroom soup and fried onions, you could substitute that with Health Valley Cream of Mushroom Soup and Funyuns. How easy is that?! Rolls – I buy mine from Whole Foods in their gluten-free freezer section. You could also use this recipe. And, there you have it! A gluten-free feast! Enjoy your food this year, but enjoy the heart of it more. Be thankful! Warm, sweet, moist, yummy banana bread, where have you been all my gluten-free life? I’m so happy to have found you at last! Please make this today. And if you have any leftover tomorrow, you can slice it and freeze it. It tastes just as good warmed up in the microwave. Preheat oven to 350. Cream butter and sugar until light and fluffy. Add the eggs and beat well. Sift the dry ingredients together and add to the butter mixture. Blend well before adding the sour cream, vanilla, and bananas. Add the nuts, and pour into a greased bread loaf pan or muffin tins. Bake for 1 hour- less if using muffin tins. Test with a cake tester before removing from oven to cool. I have eaten many attempts at a great gluten-free chocolate cake, but this one wins the award. It has a wonderful light and moist texture and a rich chocolate taste. And, guess what the secret ingredient is? Zucchini! I promise you cannot taste even a hint of the zucchini flavor; it’s just there to marry the gluten-free flours and the chocolate and leave you happily ever after. Finally, I’ve found a chocolate cake that I can serve at birthday parties to the gluten-free crowd AND the “normal” crowd without apologies. This recipe is from one of my favorite cookbooks, “Nearly Normal Cooking For Gluten-Free Eating”, by Jules Shepard. It is listed as “Zucchini Brownies”, but to me it’s more like a light and fluffy cake. I can’t wait to eat it with icing on top too. Preheat oven to 350. Beat together first 4 ingredients, then add remaining ingredients until the batter is thoroughly mixed. Spread batter into greased 8×8 baking pan. Bake for 20-40 minutes or until batter is no longer shiny and wiggly and when a cake tester inserted into the center comes out nearly clean. Pour frosting over warm cake. Melt butter in a saucepan. Add cocoa, stir to combine, then turn off heat. Add the milk, vanilla, and powdered sugar. Stir together. Pour over warm cake. Spaghetti Squash is a very healthy way to “replace” gluten-free pastas with a cheaper option. This veggie has 42 calories per cup (compared to whole wheat spaghetti’s 174) and 10 grams of carbs (versus whole wheat spaghetti’s 38). It’s also so fun to shred, watching it magically turn into stringy “spaghetti”. All you have to do is cook, shred, and add sauce. To start, put the whole squash in the microwave for a minute. Slice it lengthwise, remove seeds, and place both halves cut side down in a microwaveable dish with a half inch of water in the bottom. Cook for 12 minutes. With a fork, shred the insides into strands. Top with your favorite pasta sauce. Pepperoni adds a nice flair too. These are great as a side dish or as the main course. They’re quick and easy too! Mix all ingredients except salt in a bowl. Heat oil and butter in a skillet over medium to medium high heat. The butter is important to give a golden brown color. Drop spoonfuls of mixture into skillet and flatten out a little. I like to drop a little less than 1/4 C. for each cake. Cook until browned, then flip to cook the other side. Sprinkle cakes with salt to taste. Tres Leches is a traditional cake from Mexico. It gets its name from the “three milks” that you blend together and pour on top until the cake soaks up all the moist, sweet deliciousness. Tres leches is perfect for a gluten-free cake, because the milks overcome the shortcomings gluten-free cakes sometimes have in the dry, crumbly department. The cake really is a side-show to the milks, and if I were to be totally honest I would admit to you that I actually drank some leftover milk mixture straight from the bowl. Now that we have Betty Crocker’s Gluten-Free Yellow Cake mix, this is a super easy way to make a fancy cake the cheatin’ way. First, bake the cake according to directions and cool. Invert cake onto a platter with a rim. Pierce top of cake all over with a fork to give the milk a chance to soak in. Then mix a can of sweetened condensed milk (I used fat-free), a can of evaporated milk, and 1/4 C. of heavy cream in a pitcher or a bowl with a spout. Slowly pour about half of the milks onto cake, letting it soak in as you go. Pour it all the way to the edge of the cake. Because the cake mix only makes an 8×8 size cake, you will only use half of the milk mixture. If you wanted to use it all, you could make 2 boxes of cake mix in a 13×9. Or you could drink the rest, little by little throughout the day, pretending that it’s OK, because you used “fat-free”. Let the cake soak in the milk while you make the whipped cream for the top. Whip the rest of the heavy cream (I used a pint size) with 3 T. sugar until it is think and spreadable. Spread the whipped cream on the top and sides of the cake. Serve each slice with a cherry on top, or chop up some cherries and top the whole cake with them.